Move on over quinoa! 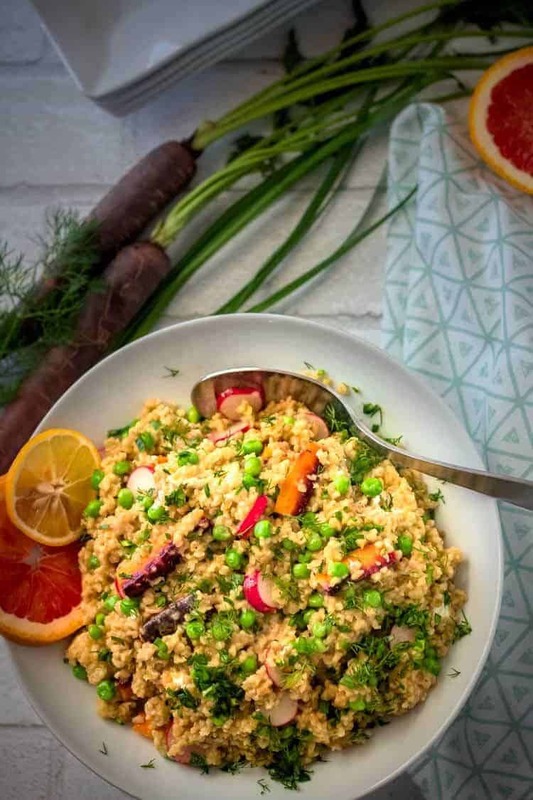 There’s a “new kid” in town… Spring Vegetable Freekeh Salad with Citrus Dill Vinaigrette highlights this unique grain with its chewy, smoky complexity, and delivers tons of flavor and nutrients. Serve alone as a side dish, add chick peas for a healthy vegetarian dish, or (our favorite) top with a sous vide salmon fillet! It’s March 1, and spring should be just around the corner? (In the northern hemisphere 😉 ). For those in the frozen north, I know you long for signs of spring. For this girl in deep south Texas on the Gulf, spring can be elusive. We had snow this winter (highly unusual), and nearly lost our 3 banana trees to the freezing temperatures. And then it was summer… We hit 93 degrees and humid in mid-February. Geez! Spring is a wonderful season in gardens and kitchens alike. How many of your favorite vegetables make an appearance in early spring? 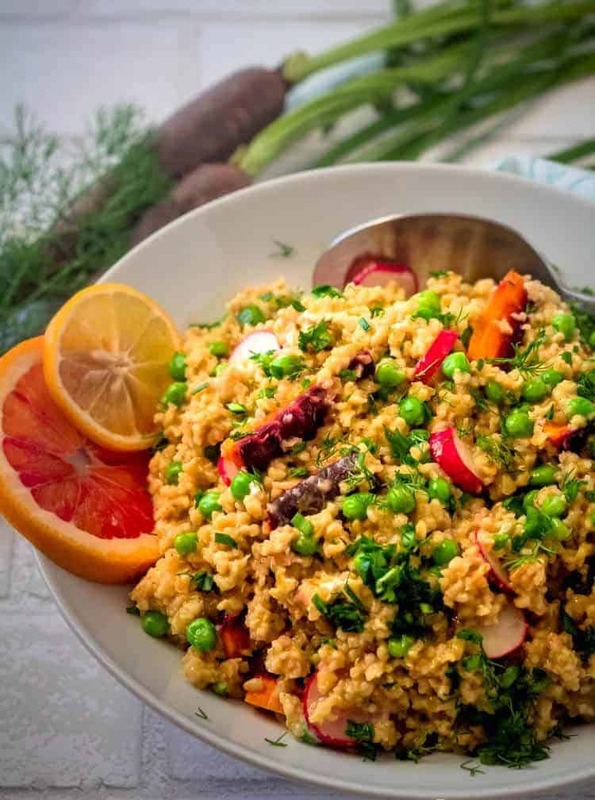 My list includes English peas, radishes, and real “baby” and heirloom carrots featured in my Spring Vegetable Freekeh Salad, but artichokes and asparagus are right up there! What are your favorites? Or do you merely tolerate vegetables? Freekeh is wheat (and therefore NOT gluten free) that is harvested while still young and green, then toasted and cracked. While still mostly unknown in the US, it has been a staple of Middle Eastern and Mediterranean cooking for thousands of years. Freekeh is a “super grain,” loaded with fiber, protein, and nutrients. It contains more fiber and protein than quinoa, and provides calcium, iron, and zinc. It may be tolerated by individuals with wheat sensitivity due to the fact that it has not evolved the way our modern wheat has. I love both the flavor and texture of freekeh. It’s a bit smoky and nutty, and holds its texture very well. It cooks in 25 minutes – more quickly than brown rice and barley. You’ll love it in salads, hot dishes, and as a simple pilaf to go with your main… You may even love it for breakfast! Organic Cracked Freekeh from Bob’s Red Mill is my “go to” freekeh. I know that I can count on quality and consistency with their products! If you are unable to find it in your local market, head over to their website, and order it online! 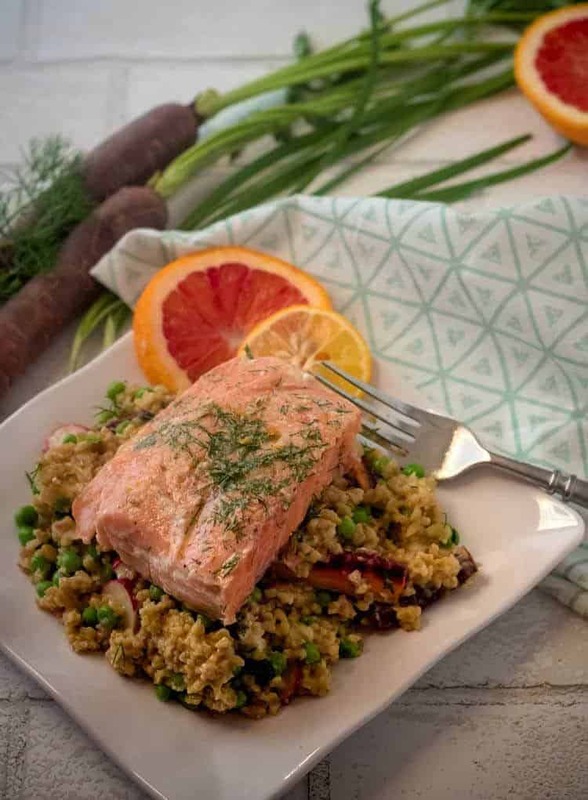 In creating this freekeh salad, I was looking for fresh, spring flavors using seasonal ingredients. No herb says “spring” IMHO than dill. The dill in my herb garden is plentiful in early spring (before the heat of south Texas takes its toll!). I went with a light citrus and dill vinaigrette that beautifully highlights the fresh ingredients. Adding cheese is optional, and if you’re dairy sensitive, you’ll still love the salad in its absence… We love it with both feta and chèvre, with feta having the edge. I had a chunk of chèvre that needed to be used on photo shoot day, so if you see cheese at all in the photos, that’s what you’re seeing. Dicing or crumbling chèvre is not really an option. 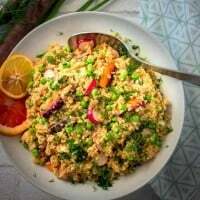 Lastly, this delicious and nutritious freekeh salad is easily turned into a main dish. For the vegetarian, add beans or legumes. I highly recommend chick peas! For seafood lovers like me, a salmon portion perched on top is perfection! In fact, on photo shoot day, we topped our Spring Vegetable Freekeh Salad with a sous vide salmon fillet with meyer lemon and fresh dill. YUM! Move on over quinoa! There's a "new kid" in town... Spring Vegetable Freekeh Salad with Citrus Dill Vinaigrette highlights this unique grain with its chewy, smoky, slightly complexity, and delivers tons of flavor and nutrients. Add the freekeh and salt to boiling water in a medium saucepan. Reduce heat to medium-low, and simmer until liquid is absorbed (about 20 minutes). Remove from heat, and allow it to stand covered for 5 minutes. Remove to a large mixing bowl or prep bowl to cool completely. While the freekeh cooks, prep the dressing. 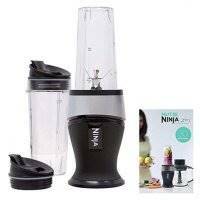 Combine all ingredients in a small blender, and blend until smooth. Set aside. Prep all salad ingredients. (See notes). Add the prepared vegetables to the bowl, along with cheese (if using). Pour on the Citrus Dill Vinaigrette, and toss to combine. Garnish as desired, and enjoy! Refer to your freekeh package for amount of liquid under "basic instructions." The Bob's Red Mill freekeh that I use requires 2 1/2 cups liquid, but they're not all the same! On a lucky spring day, I can get my hands on a package of fresh shelled English peas (YUM!). I lightly steam them. Frozen petite peas are a good substitution. I just give them a good rinse until they're completely thawed, and drain them. We're at the height of citrus season in the Rio Grande Valley. I used half blood orange and half meyer lemon juice. Grapefruit and tangerine would be great choices as well. If you use regular lemon and/or lime juice, you may need to adjust the sweetness to taste. Macronutrients (approximation from MyFitnessPal.com): 349 calories; 11 g protein; 41 g carbohydrates; 15 g fat. Includes 1/4 cup feta and all of the vinaigrette. Colavita Aged White Wine Vinegar - 17 fl.oz. I LOVE the flavor of dill, so this freekeh salad is totally up my alley! This whole dish sounds amazing, but I'm particularly drooling over that citrus dill vinaigrette! I can't wait to give this a try! That Citrus Dill Vinaigrette is lovely, and good on many other salads as well. I hope you do give it a try! This salad looks beautiful and very delicious! definitely want to try it) I love dill vinaigrette! Thank you Veronika! I hope you will try it... it's a really nice, healthy spring/summer salad option! I'm one to always be looking for new ingredients, and they eventually end up on my blog! Be sure to look in the Bob's Red Mill section of your market. You may find it there! I don't think I've ever had Freekeh! I'll have to look for it at the market, because this salad looks fantastic. The vinaigrette sounds so lovely - citrus and dill make such a beautiful pairing! Hey Tamara! This salad is really making me miss the green grass and the warm weather! Lots of colors and flavors in this dish. Chef approved! I have never had freekah but this looks AMAZING and I absolutely have to make it! All of those fresh spring vegetables are just perfect, yummy! Well, I'm glad to bring you a recipe for an ingredient you've never had! Love it... Aren't spring vegetables amazing? I love the change of seasons, and all that comes with it - although we are very much lacking your weather! Such a beautiful salad, and that dressing sounds so fresh and tangy! I'm bookmarking it to try when the weather warms up!! 93 degrees in February! Wow. Hope you have a milder 'Spring' in your area for sure. Love this salad for those of us though that are longing for the much warmer weather. Lol. I know so many parts of the US are still having heavy snows and freezing temperatures... We're actually not as consistently warm here in the RGV. I do love this salad year 'round in warm weather. The freekeh is not heavy at all! I am a big fan of dill, sadly so is our goat, and he will reach over the fence and nibble the tops off!!! I really must dig it up and move it further from the fence. Although he would probably try and jump the fence. Feekeh is such an underused grain. I have to go to a specialist deli over an hour away to buy it. (That isn't a hardship as it is a beautiful place for a day trip....and I can always take a trip to the deli!) This just looks stunning!!!! I can see a trip to fremantle deli coming up soon! Lol. I love your goat! It gets too hot pretty early in the year here in the Rio Grande Valley, so it's more of a winter herb for us. We do love it! Freekeh is our new favorite grain. Fortunately, I can get it at my local market! This is the salad of my dreams right now! I love all of those spring veggies and those herbs. Can't wait to try it! 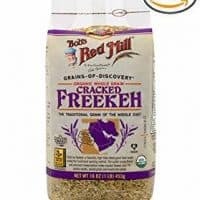 I have NEVER heard of freekeh. I am always game to try new ingredients, and love Bob Mill products. This sounds like a nice hearty salad. I love the taste of dill...so that dressing would be amazing for sure. I can think of lots of places I would love to use it too. Awesome! I'm such a fan of Bob's Red Mill too. I do cook a lot of Middle Eastern, so I'd heard of it, but never cooked it until I asked to try it. We loved it! It is so hearty, fully of fiber and nutrients, and cooks relatively quickly. And I have been working on a salad dressing Ebook forever. The citrus dill vinaigrette will definitely make the cut! Thanks for stopping by Gloria! I love this idea because freekeh is one of our favorites at the moment! Your vinaigrette sounds ideal for all the veggies! 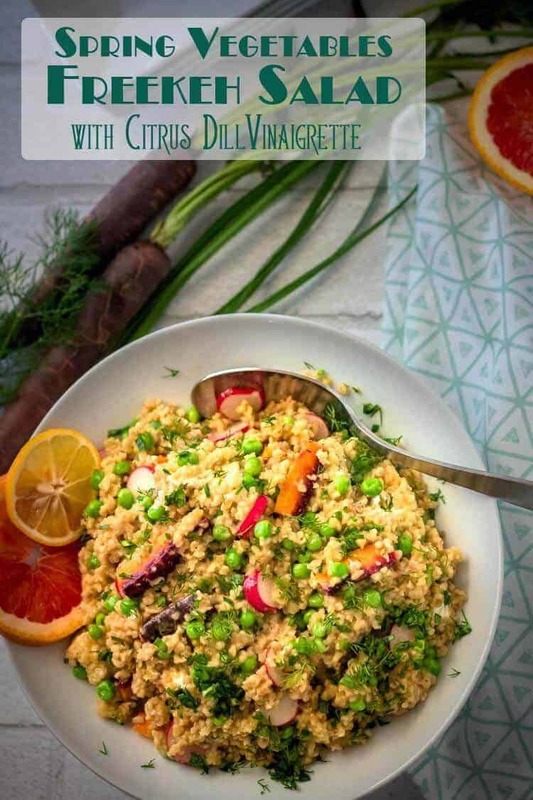 It definitely tastes like spring in a bowl with the citrus dill vinaigrette and spring vegetables, and yeah, the freekeh is so healthy and nutritious... Thanks Michele! This is a great salad that features a little-used grain. I love grain-based salads in warmer weather. Hearty and wholesome without being heavy, right?